Sun, blue seas and long lazy days on the beach are all part of summer. After a refreshing dip in the salt sea water the picnic tastes even better. Save one of these days for the natural sandy beach at Degersand in Eckerö. The long and shallow beach is a popular place for families. It is situated in a protected bay, yet offers a fantastic view of the sea. It’s easy to enjoy Bamböleviken with its diving tower, fine smooth bedrock and shallow sandy beach. The beach is located by a beautiful sea bay where it is sunny and pleasant all day. You can swim either in shallow or deep waters at Bamböle, which means that the older children can enjoy the diving tower while the smaller ones play at the water’s edge. The Mariebad swimming pools and spa centre has a superb position over the waters of the eastern harbour. With its bubble pool, giddying water slide and exciting fun pool – not to mention the 8-lane exercise pool – the centre is fun for the whole family. Outside the centre there is a sundeck and swimming jetty exclusively for Mariebad guests wherea the beach and café are open to everyone. Weary bodies can be soothed with some pampering in the Spa. Training, competition or exercise swimming – Åland offers swimming options for people of all levels thanks to a new swimming centre in Mariehamn and a new swimming pool in Godby. These establishments can take groups of up to 60-70 people. Since the halls are just a 15-minute drive from one another, the groups may also split up and train at different centres. The main pool has eight lanes; it is 25 metres long and 21 metres wide. That means that each lane is 2.5 metres wide instead of the normal 2 metres. The pool is ideally fitted for competitions and is considered a fast pool. The grandstand on the first floor seats 250. It meets all international regulations for the biggest competitions. The proximity of the Godby hall means that it is possible to combine swimming practice with use of the sport hall’s gym, sports hall, conference premises for 25 delegates and serving area. Near the hall there is a lit exercise track that also functions as a skiing track in winter. In addition to the exercise and competition pool, with its eight 25-metre lanes and electronic timing, the swimming centre also offers an adventure pool with many fun activities for both children and funloving adults. Now you can take your sauna to wherever you want to swim. If you rent a sauna boat, that is. Just take the rudder and set your course for the nearest beautiful bay. Sauna boats are available from Sandösunds Camping, or at Långvikens Stugor. Summer and sun could mean pleasant days at the beach – or speedy water activities with a boat in the Åland archipelago. If you’re curious about the latter alternative, please don’t hesitate to contact Patrik Larsson at Larssons Vattensport. 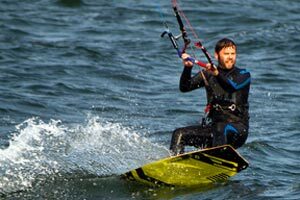 Patrik offers kiteboarding and parasailing, as well as the possibility of hiring water skis, wakeboards and other fun-filled water activity equipment to attach to a boat. Larssons Vattensport also offers group activities for companies, conferences, stag parties, hen parties, groups of friends and other types of groups. A group of a suitable size can try parasailing, water-skiing, wakeboard or inflatable water toys for three hours. “You can either visit me here in Ödkarbyviken or I can put the boat on a trailer and come to a place of your choice”, Patrik explains. “It will be a slightly different day – a welcome break in a day full of business meetings”. Patrik also has water sports equipment for hire, either for a day or for a full week. Thanks to wetsuits, the water sports season stretches into September. Patrik also has plans for arranging kiteboarding courses on ice in the winter, for both long distance skaters and snowboarders. “Åland has a long season for water sports in the summer and riding on snow and ice in the winter – and we can use the same equipment”, Patrik concludes. Mariehamn is a town that is brimming with secrets. There are a large number of caches to be found. But what is a geocache, actually? During busy holiday times it’s great to be able to pause for breath and recharge your batteries. In Åland there are plenty of naturally beautiful places that provide an invitation to reflect and meditate. There will be several festivals during the summer. New for this year is the Baltic Shanty Festival with traditional maritime songs. Both Fishbait and Åland Pride are to be hold the second year in a row. This is a route suggestion for those who enjoy life. The trip is never boring, so take it easy and enjoy the views. The Åland Islands are known as cycle-friendly islands. The short distances from A to B make them excellent for cycling and motorcycling. Take a look at our route suggestions.